Nice weather, dry enough grass, sun is shining, planes flying great.. It is my great pleasure to announce maiden of this small & quick project. It was rather nonevent event as it just flew. Nothing special. Video shows everything needed to show. 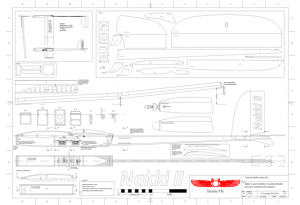 I finalized production plans of Nakki II. Changes to beta-version were extremely minor. I did widen parts A, B, C by 5mm and adjusted some of aligning holes to better suite cocktail-sticks I am using. Finalized product page can be found at here. Only thing remaining is to wait for suitable weather for maiden flight. Final weight, with servos, receiver, 3S360-battery, motor and all installation stuff was 208g which results to wing loading of 11,6g/dm². Done. Total weight with 3S360 is 208g. Total weight is 208g, with everything. And it looks like this..
And second day of this (hopefully) short project. Combined weight at this stage is 77g. Then let’s cut wing into pieces. Nervous. And after cutting let’s glue it together again. Just wanted to build something quick as I have not been able to build anything more impressive for a while. 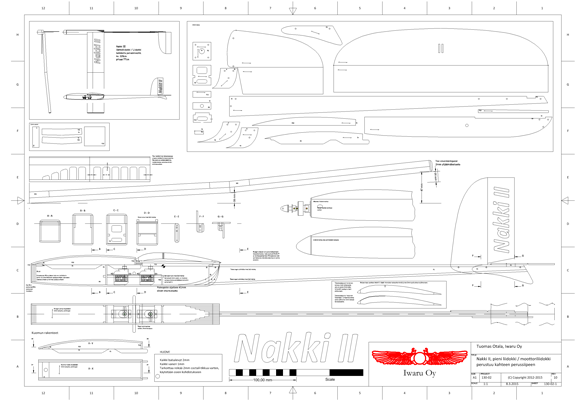 Dish of day is Nakki II. Which is translated easily to Sausage II. This has been briefly mentioned in this blog some time ago. See here. This design uses ‘perussiipi’ which is basic wing manufactured by local vendor from styrofoam. I do dislike styrofoam, but in this case it is ok, as this is sort of ‘classic finnish modelling stuff’. I will compile extremely short build log into this blog. I cut cardboard templates for cutting lightening openings. Wing is being supported using 3mm carbon flatrod.